Orb Gaming and ThumbsUP! 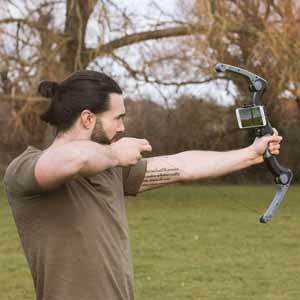 do a range of gaming accessories and have recently released their Virtual Archer, an augmented reality bow, which connects to your android or IOS phone. The software is free to download, and the bow connects to your phone via Bluetooth. You will need to buy two AAA batteries as these are not supplied with the kit. The bow will take a phone up to seven inches. The bow is supplied in a sturdy cardboard box (22.5 cm x 44.5 cm x 5 cm). Unpacking your bow, you will find a small bag with a Philips screwdriver, required to open the battery case. Batteries should last about fifteen hours. Also included are the instructions in seven European languages and a QR code to connect to the app. Internally, the bow is well protected by the packaging. The bow is sturdily constructed from black and grey plastic, which gives it an attractive, quality look. The bow arrives in its closed position, so the first thing to do is extend it to its full length, by pulling the arms out until they click into place. Fully extended the bow measures fifty-four centimetres. It can be returned to its starting position via two sliders on the inside of the bow. So, it has a good build and looks nice, it's comfortable to hold, but the real test is whether the software is up to the job. There are a couple of options for the games, it looks like you can use the games with not only the bow, but also with the ARgun, the Qooo and the Gunit, though I have no idea what the last two are. You get six free games. A Storm of Arrows has you defending a castle from invading troops with the idea that you kill as many as you can, before they can breach the gate. Your field of vision is 180 x 180 degrees and the enemies travel at different speeds. Hit them and you score, kill them for even more points. The Lost Jungle. Here your creeping through a jungle environment and this is where that small button comes into play as you use it to run, although you cannot run and shoot at the same time. Its another nicely detailed environment. Dragons Defence. This has you defending your castle against dragon attack. Each of these games seem to be designed to show slightly different aspects of the bow’s system. In this game you can use in-game currency to summon more archers, triple the power of your bow or restore some HP. Options are chosen via the bow’s button. This is a VR game which uses the phone camera to provide the background. This works best as an outdoor game as indoor environments can be a little too cluttered to get the best out of the game. Hunters Mission has you stalking and killing various big game. There are twelve different animals to kill. A successful kill grants you money which you can spend upgrading your bow. The Walkers. This has you standing still in basic environments killing zombies with the bow. Each mini game cranks up the difficulty until you are inevitably overwhelmed. Saving Mr Doogle. At least I think that’s what it said, the text is incredibly small on the screen. This is very much like the ‘Golden Shot’ for anyone old enough to remember. The dog is dangling off the wall from some targets, with a moving set of spikes travelling back and forth. Your job is to drop the dog so that he does not land on the spikes. The app also gives you the option to purchase more games for 30 yen. Although the quality of the games can be variable, they are an improvement over those supplied free with the ARgun and do a good job at demonstrating the unit’s capabilities. Overall, they have made some good improvements and the bow is sturdy enough to be used indoors or outdoors. My only concern would be having to replace the bow string if the kids get over excited as there is no obvious way of doing this.